Your adventure starts with a beautiful 14-mile backcountry gravel road drive along the rim of the Klutina River Canyon. The route offers great views of the river below and huge vistas of the surrounding country. Your guide will explain the natural history of the area, and its gold rush history. 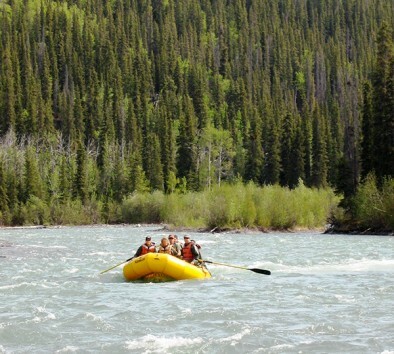 This is an easy and fast river with some intermittent and splashy class III rapids. This is ideal for first-timers as well as experienced rafters. Just hold on and ride along in an oar boat as your experienced guide takes you on an adventure you’re sure not to forget! Minimum age is 10. Maximum weight is 270 lbs. Rain gear, boots and life jackets will be provided. Pregnant women or guests with heart or mobility problems are not allowed to participate. Must be able to walk and climb in and out of raft unassisted. Time on raft is approximately 3 hours.